Thanks so much for stopping by for the sixth day of my BIG giveaway! I am BEYOND BLESSED to work with some amazing companies who have offered up some of their awesome products. Not all of the giveaways are necessarily sponsored by the companies (meaning, some of the stuff I had at the house and wanted to spread the wealth), but even still, they are all companies I love and want to spread the word about. Just a word of warning: Make sure to stop back daily as I will be having a new giveaway every day for the next SIX days and would hate for you to miss out on any of them. Also, some of the entries are available daily (ie tweeting about the specific giveaway, pinning a picture on Pinterest, etc), so if it is an item you are super stoked on, I’d recommend entering as many times as possible. If you know me, then you know I LOVE to sparkle! Sure, the most common color in my "normal" attire is probably heather gray, but even so, SPARKLING IS MY FAVORITE! And sparkling with a Sparkly Soul headband is DEFINITELY my jam! You see, I have some pretty cray-cray hair (I have to blow dry and straighten it daily or else it could probably end up with a bird in that rat nest on top of my head) and I am SUPER STOKED that I found a headband to help tame my mane! But, I promise, they don't make you crazy... That, folks, you can blame thank my padres for ;). But, in all honesty, Sparkly Soul headbands are a MUST for me! At last count, I broke into the 40's (please, don't offer an intervention, I am totally aware it's an obsession, but I am 100% fine with it). They are non-slip, they fit every head size (and you know there are some weird ones out there ;)), won't give you a headache, come in a billion and a half of colors/ patterns, and has a mission to celebrate people who find their strength and soul while pushing themselves to their limits (I mean, what's not to love?!). 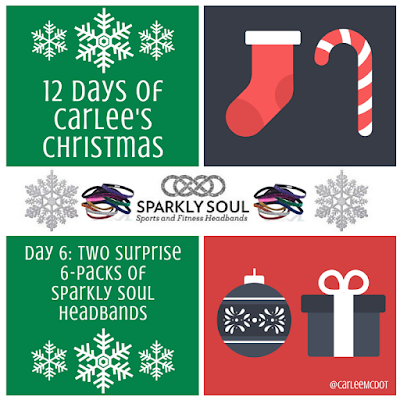 And the AMAZING ladies of Sparkly Soul are offering up a surprise SIX pack of headbands to TWO lucky folks! Pretty fan-freakin'-tastic if you ask me! You can keep them all for yourself or share some of your winnings with a friend (cough cough, wink wink... ME!). I've heard THE BEST WAY TO SPREAD HOLIDAY CHEER IS SHARING SPARKLY SOUL WITH FRIENDS FAR AND NEAR! A HUGE thanks to Sparkly Soul for sponsoring this giveaway and supplying the prizes! PS If you don't already follow them on social media, you need to because there are always AMAZING giveaways and specials that you do NOT want to miss out on! As with all of these giveaways, they will run for seven days. The winners will be selected on the eighth day. This one will run through December 12th at 11:59pm. The giveaway is open to US residents only. The winners will be contacted via the email address associated with their Rafflecopter account and will have 24 hours to claim their prize. All entries are verified, so please be sure to complete them or a new, random winner will be selected. I love sparkly soul headbands! I wear at least one a day! These are so great for keeping my bangs out of my face! I LOVE to rock a headband when I work out! I like Sweaty Bands and Sparkly Soul bands! I rock either a bandana or one of these headbands!! I nlynhave 6, but could probably have 100 if I let myself. I LOVE the new ones with the little bows, so super cute!! I just discovered these at the Rock N Roll Vegas expo and now I'm obsessed! I bought two there, but now I need ALL of them! I have been wearing Sweaty Bands but have noticed that they stretch out a big and some are now too big!! I love sparkly soul! 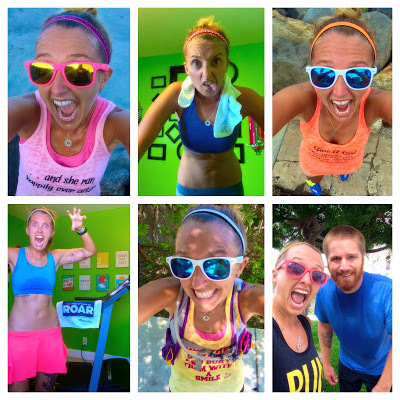 My favorite headbands to run in! I live for Sparkly Soul! I've only been wearing them for a little over a year, but I can count on one hand the number of days since I got my first one that I haven't worn one! I have 20 right now, and more on my wish list daily! They're the best for running, coaching, or just lazy Sunday coaching! I haven't tried sparkly soul but would love to! Having a little sparkle in your life is necessary! My two favorite things: sparkly, and headbands! Both come together in one?! NEED! I LOVE wearing headbands when I run. I love Sweaty Bands, but I have never tried Sparkly Soul. Headbands are my jam! I have baby curls all around my hairline that can only be controlled by a headband. I always have to wear a headband while exercising! Cute ones are always a plus- they keep the hair out of my face while I look stylish! I have a few Sparkly Soul Headbands but would LOVE some more!!!! It's so fun to match them to my different outfits - and they are the only headband I've found that doesn't slip!! Love love love Sparkly Soul! I have one clip to hold my bangs out of my eyes. I've tried some headbands in the past but they have always given me a headache! I'd love to try this brand! I'm totally a headband person. Hats and visors give me headaches, but I need something to hold my whispies back! Sparkly soul headbands are my absolute favorite. If I'm not wearing one, it's because it's raining and I have my headsweats hat on. I've tried a number of other headbands or visors and I keep coming back to sparkly soul headbands and and team sparkle visors. Why can I say, I love me some sparkle!! I love a good headband, but i do struggle to find one that works, so lately my go to has been a hat. I just pull my hair back in a ponytail. Of course I will immediate hardly working out which I need to change. So a good headband would be great! Haven't tried the, but would love to. Everything always slips out! Love these headbands and thank you for turning me on to them. I rock one at every run and workout. Haven't ever tried them, but would love too......the no headache sounds wonderful to me as I have been having some issues with that on long runs from my visor. I need these! I have a really small head and always have trouble finding headbands that stay on my head. 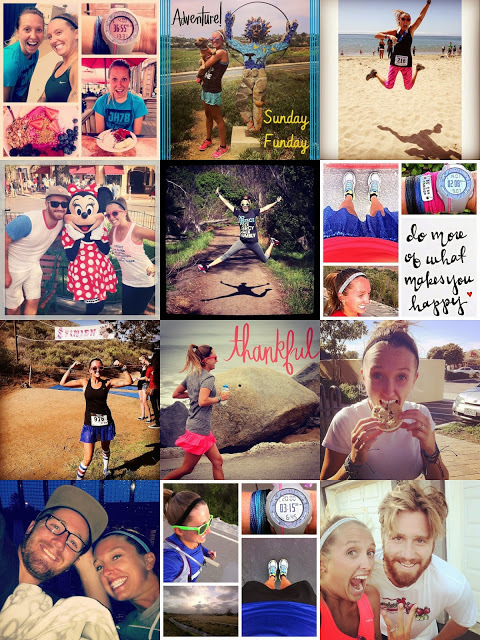 Sparkly Soul headbands are my headwear go-to when running! Ohhh I'd love to know what colors are in the packs?!?!? I have always wanted one of these headbands for running. My very thick hair ca only be held back by few headbands and I think these ones will work great. I am obsessed with sparkly soul! If I have to a wear a visor when I run too. I usually just wear a headband. Bondi is my go to since I can't find any other that stay on. I'm a new fan of these headbands, they seriously don't move in my thick hair. Love them! If I had to select one it would have to be a headband. I just started wearing them and love them! I have never worn the much talked about Sparkly Soul, would love to try them! Sparkly Soul Headbands are the best!!! I usually go for hats because I have not been able to find a good headband but this could be it! I love headbands! I normally have to use skinny ones because otherwise they slip off my head easily! I love Sparkly Soul headbands! You're right, they don't slip at all. I love headbands!! I haven't tried sparkly soul headbands yet. They are on my Christmas list!!!! I love to run in my sparkly soul head bands. Some days I need my nike visor. I wear sweaty bands when I run. Love them! Hats in the rain or snow or to hide my gangly hair during a relay race. I'm a sweatfest so this head needs to breathe! I do like thick headbands that cover my ears during the winter. Maybe some sparkly soul headbands can tame my crazy hair. I love Sparkly Soul headbands too. I prefer headbands when I workout. I really do not have a favorite brand and would love to finally try this brand out. Head band when I am working out at the gym. Hat when I am running. I generally wear either a headband that tends to slip off my head or a hat. Sparkly headbands would be fun to try! These are THE ONLY headbands that stay on my head (and I've tried dozens). I typically prefer headbands to anything else while running, although I do like my one headsweats visor (while is sparkly, too). Yesterday I started my long run in a headband since the sun was behind me and kept my visor in my nathan backpack and threw it on when I needed it later in the run. Worked perfectly! I'm totally a headband girl. Sparkly Soul are my favorite!!! I love Sparkly Soul headbands too! I LOVE my 2 Sparkly Soul reflective headbands! This would be awesome for the days that I don't need the reflective aspect! This are so cute!! and expensive $$! I bought a cheap headband over the summer to keep the hair off my face, then lost it... haven't bought another yet. I like my winter hat to keep my hair off my face, but this are so cute! 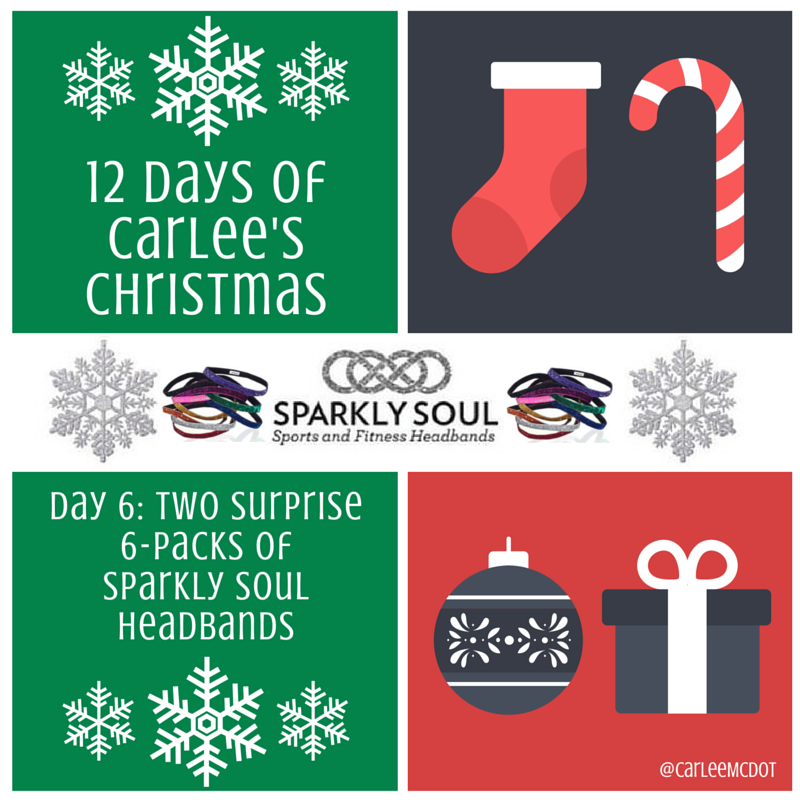 My go-to is a headband and OF COURSE it's a Sparkly Soul! I don't have 40...yet! PS: I love your facial expressions in your pictures! I love my Sparkly Souls, from running to casual, they complete the look! Who couldn't use a little more sparkle in their life! I just got my first Sparkly Soul Band to wear next month for the WDW Marathon - love it! LOVE Sparkly Soul! What I wear depends on what time of day I run here in Texas. If the sun is high in the sky, then I have to wear a visor. Otherwise, I "feel cooler" (temperature wise) by wearing a headband to control my curly tresses. I have just a few Sparkly Soul headbands, and they are by far my favorites! Headbands are my favorite, unless it is raining then it's a hat! I like to wear headbands while running. Have not tried these, but would love to! I usually don't run with a headband. Thanks! Your the sparkliest!! I love their headbands they are the best! My fav headwear would be my headsweats visor from Sparkle Athletic! I wear them almost every race! When I workout I put my hair up in a floppy bun and stretchy headband made of funky colours!! These are a must with my new short hair! I've been wanting to try these! I typically just wear a hat when running. I haven't found anything to tame my crazy hair! I always wear headbands when I run... and I love to sparkle too! So these are perfect in my book! You know I love my sparkly soul! But I'm good for a visor too! I hate full hats and rarely run with one. I love headbands (and visors). This brand is new to me and I am really loving these! I love running with headbands and have always wanted to try try this brand!! I love headbands...hats don't stay on. I use headbands for short runs and visors for long runs. I need a good headband because the ones I have now don't stay on and I have fine baby hair around my temples that always gets out of the headband. Recommendations? I'm addicted to Sparkly Soul, so those are usually my go-to for workouts...and any time! I LOVE Sparkly Soul headbands!! I love the Sparkly Soul Headbands. Usually a hat or visor :) Gotta protect my face from the sun! I almost always wear a headband, and I add a baseball cap if it's sunny out. I've been dying to try these!! I just recently found Sparkly Soul, but it was love at first fit! And who doesn't need more Sparkle in their lives?!? I love anything that sparkles!!! I usually wear headbands when I run or workout. I love Sparkly Soul headbands when I run and play soccer! They stay through it all! When I ride I wear Sparkly Soul and even during the day but when I run I tend to wear Sparkle Athletic visors to help keep the sun and sweat out of my eyes. Where have these been all of my life?!?! I need more!